According to Herdotus the Babylonians had no physicians; the patient was brought out in the market place and all passers-by had to confer with him "to discover whether they have themselves been afflicted with the same disease or have seen others so afflicted and advise him to have recourse to the same treatment as that by which they escaped a similar disease, or as they have known to cure others." But the code of Hammurabi with its rewards and penalties for physicians, gives a glimpse of an already more highly organized system at a period earlier than 2000 BC - long before Herodotus. The Code enacts that for a successful operation which saves the eye of the patient the fee be ten shekels of silver in the case of a "gentleman," but only five shekels and two shekels in the case of a poor man and owned slave respectively. For an unsuccessful operation on a freeman causing death or the loss of the eye, the surgeon shall have his hands cut off; in the case of a slave the penalty was to replace him by another. Babylonian medicine was probably in the hands of the priests of the healing divinity Ea and his son Marduk, whilst surgery, as almost everywhere else in early medicine, was in the hands of a special class of skilled hand-workers. The etymological derivation of surgery is significant for ceironrgia, means handicraft. The priestly, non-operative practice was not regulated by law; but that the work of the surgeons was not altogether despised is shown by the very liberal scale of fees, for five shekels was equivalent to the yearly rent of a good type of house and represented 150 times the daily wage of a workman (1/30 shekel). The medicine of the priests was a mixture of superstition and ignorance; treatment consisted of incantations and also the administration of foul remedies - probably to disgust the demons causing the disease. It would appear that the practice of the surgeons was supervised by the priests. but it is by no means clear what their work was. It is quite possible that the greater part of the Babylonian surgery consisted of couching cataract. On the other hand, the eye operation spoken of may merely have been incision of an abscess of the lacrimal sac. The whole evidence turns on the significance of an obscure work in the code, naqabtu. The earliest records of Egyptian medicine date back to a period not much later than the Code of Hammurabi, the Edwin Smith papyrus to c. 1600 B.C., the Brugsch papyrus to c. 1300 B.C. and the Ebers papyrus to c.1550B.C. A remarkably advanced state of ophthalmology can be inferred from the Ebers papyrus in which a section is devoted to eye disease, treatment rather than clinical descriptions being given. INcantations, foul applications and all the other manifestations of superstitious ignorance abound, but there is evidence of an advance that must have involved centuries of empirical practice and observation. The most significant development is the recognition of a number of distinct diseases. According to Ebers the Egyptians knew such conditions as blepharitis, chalazion, ectropion, entropion, trichiasis, granulations, chemosis, pinguecula, pterygium, leucoma, staphyloma, iritis, cataract, hyphaema, inflammation, ophthalmoplegia and dacryocystitis. The attempt at differential treatment implies a degree of differential diagnosis; nevertheless it was still the medicine of the temple that they practised. Indeed the Ebers papyrus is probably the work of priests, thought it is not, as was once thought, a part of the lost six medical books of Hermes containing the divine knowledge of healing as set down by the Egyptian priests. There is no evidence that Egyptian surgery had made any marked advance; the only surgical procedure mentioned in the Ebers papyrus is epilation, a practice that must have been widely spread judging from the frequency with which epilation forceps have been found in relics of the New Empire. Later development in Egypt brought but little advance, though there is much evidence that Egyptian ophthalmology was held in high esteem in ancient world. Herdotus relates that Cyrus of Persia sent to Amazis, the king of Egypt, for a physician to cure him of his eye trouble. The decline of Egyptian civilization brought with it that type of specialization which is based not on expert knowledge of a detailed field, but on ignorance of every other subject. Both the prophet Jeremiah and Herodotus found the country full of physicians and Herodotus remarks that "one treats only the diseases of eye, another those of the head, the teeth, the abdomen, or of the internal organs." Nowhere in the Ancient East was medicine ever freed from the shackles of supernatural belief. Observation was coloured by preconceived notions of the demoniacal origin of disease. Here and there a glimpse of a modern procedure is seen, based on methods and premises different from ours. In Hindu medicine there is a suggestion, in the writings of Suçruta, of the earliest record of surgical treatment of cataract by couching. In Hebrew writings there is a textually obscure reference to improvement of a woman's appearance by having a golden eye (in the place of a missing one), an interesting and significant remark in the light of later history, for prostheses made of gold were the first to be used and were not introduced until the 16th century at the time of Ambroise Parè. Early Greek medicine differed in no essentials from that of the rest of the ancient world. There was the same priestcraft, the same temple worship and supernatural cures. Nor were these temples as holy as they seemed. It was only with the rise of the Asclepiadaæ, a group claiming descent from the God Aesculapius, but dissociating themselves from the priests of the temples, that Greek medicine began. One of these Asclepiads, Hippocrates the Second, also known as Hippocrates the Great, or simply as Hippocrates, born on the island of Cos, finally liberated medicine from the thrall of the supernatural. His method is the method of modern medicine; the study of disease as an objective natural phenomenon. 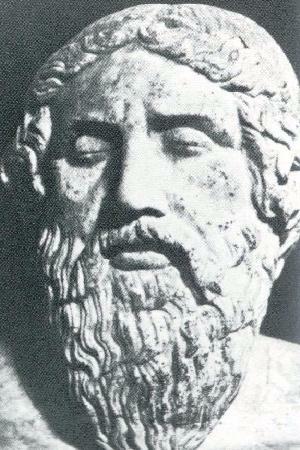 The lasting achievements of the Greeks are commemorated in the term physician derived from fusiz, natura. Hence forth the physician was essentially no longer a priest but a naturalist. Ophthalmology benefited at the hands of Hippocrates and his immediate followers mainly in a negative way - in discarding the supernatural element rather than in any definite advance in the understanding of ocular disease. Their notions of the structure and function of the eye had hardly advanced, if at all, beyond that which the much older Egyptian civilization knew, though a a predecessor of Hippocrates, Alcmaeon, is credited with the discovery of the optic nerve. Their recognition of eye disease was confined to what could be observed and deduced from a knowledge limited to the superficial anatomy of the eye combined with an utter lack of understanding of ocular physiology. It is mainly in its influence on the further development of ophthalmology rather than in its achievement, that Hippocratic ophthalmology is remarkable, though it is well to recall that their treatment of some forms of conjunctivitis by irritation is still the basis of the modern treatment of trachoma. When they went astray they were wrong in the same way as the modern world is wrong when mistaken treatment is given on the strength of a wrong pathology; their failures were different in nature from the failures of those who invoked the aid of the gods or attempted to cast out the devil. Greek medicine stretches over a period much longer than the medicine of the modern period. From the appearance of Hippocrates to the end of the fruitful period of Rome is well over 800 years. During that time there was a continual development in which ophthalmology shared. Greek medicine soon became extinguished on its native soil but developed apace, first in Alexandria and then in Rome. Of the great achievements of the Alexandrian period one can only infer by comparing the end of the purely Greek period with the beginning of the Roman period, the actual records of the Alexandrian school having been lost. The study of the human anatomy began in Alexandria, and the earliest Roman writings on the anatomy of the eye, thos of Rufus, are a measure of the advance made by the Alexandrian school. After the decline of Alexandria, it was in Rome that the Greek spirit found a home. There medicine was so entirely Greek that the Romans who practised it felt compelled to adopt Greek names for themselves and their remedies. Of the writings of this period there remain thos of Celsus, Pliny and Galen; reference to other writer whose works are lost are to be found in these and later books. Galen's strictly ophthalmic writings have been lost. Of a period later than Galen's there are the works of Aetius of Amida and of Paul of Aegina, giving a full account of the medical and surgical practice towards the end of Byzantine period. In Celsus there are detailed descriptions of couching for cataract, of operations for ankyloblepharon, dacryocycstitis, and of plastic procedures for trichiasis, lagophthalmos and ectropion. Hypopyon is first mentioned by Galen. Of Galen's contributions to ophthalmology it is perhaps enough to say that nothing of any value was added to his anatomy of the eye till the beginning of the 17th century; his theory of vision was however a grievous errors. The later writers of the Greek period added some details to the practice of ophthalmology, but nothing whatever to its theory. The beacon lit by Hippocrates and tended by Alexandria and Rome was slowly sinking in a world plunging deeper and deeper into the mists of the Dark Ages. 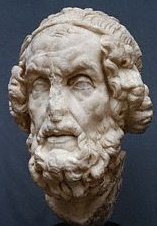 Numerous busts have survived of the allegedly blind poet Homer. The earliest portrait type, which is believed to derive from a Greek original dated c.450BC, does not, however, attempt to render his sightlessness in an explicit manner, but merely shows the poet's eyes closed in deep contemplation. Not until the second century BC did any artist attempt to portray his blindness. One of the earliest such portraits, of which there are several examples extant, has been justly described as "amongst the most beautiful portrayals of poetic genius". The absence of modelling to the eyeballs, the heaviness of the raised eyebrows, all focus the viewer's attention unremittingly on the eyes. The air of intense, almost rapt absorption and introspection exquisitely captures the inner world of the blind poet. Commonplace sufferers from eye complaints were not accorded any such deference. A terracotta from Tarsos of an emaciated man in a pointed cap exhibits "a pervasive air of stupidity, corruption and sordid cunning". The eye are markedly asymmetrical, one being circular, the other a half closed slit. Though the inspiration for this type may have derived from a comic mask, the mask in turn probably represents an attempt to render trachoma, an infectious eye disease which was probably very prevalent in the ancient world, as it still is in the Middle East today. Sudden loss of sight was also depicted with some frequency in Attic red-figure, due to the popularity of the myth of the blinding of Thamyris. On an Attic hydria dated c.430 the musician, whose eyes are closed, registers his pain and terror by stretching out his arms and letting his lyre slide from his lap. Sculptors, too, attempted the subject. Pausanias tells us that a statue of Thamyris, "already blind and holding a broken lyre", was dedicated on Mount Helikon, sacred to the Muses. It perhaps served as a warning to over-ambitious bards. The fitfully flickering flame of civilization was saved from extinction by the invading hordes of the Eastern conquerors sweeping across the known world under the banner of Allah. As before in the case of Rome, so once again Greece took its captors captive. By means of translations, first into Syriac and later into Arabic, a knowledge of the older Greek civilization was spread throughout the Mohammadean world. Ophthalmology took a new lease of life, though progress was severely handicapped by the lack of anatomical studies. Hospitals, departmentalized very much in the modern manner, grew up and ophthalmic departments were always large and important. Many operative procedures known to Galen and his successors were perfected and some important additions were made. Numerous treatises on diseases of the eye appeared, all drawing their inspiration from the Greek writings. But the centuries of Arabian dominance lacked the eager questing that characterized Greece. The Arabians perfected old procedures rather than explored new avenues; they revered rather than challenged the authority of tradition. So heavily did the hand of dead ages lie upon them, that though there is much that is valuable in Arabian ophthalmology, it is is incidental rather than the result of a conscious effort. Not infrequently they stumbled on facts and conceptions that could not be harmonized with the traditional knowledge, but they only cut their new cloth into ill-fitting archaic patterns. They had not learnt the crowing wisdom that fact is greater than dogma. It is characteristic of the period that Ali ben Isa (Jesus Hali), Alcoatin and Ammar ben Ali wrote text-books that were used for centuries. Like the Western civilization that followed it, the Arabian period was not a national movement. It was Arabian in language only; the men who made it were of that variety of nationality and religion that were to be found between Cordova and Bahdad. When decay ultimately overtook the Arabian renaissance, the torch had already been handed on to the rising civilization of Western Europe by means of translations into Latin from the ARabic versions of the Greek masters. Many mistakes were perpetuated by these translations and retranslations and it needed the European renaissance to direct onward the pure stream of Greek thought. Whilst the Arabians nursed and revived a moribund civilization, knowledge did not altogether perish in the western domains of what was once the Roman Empire. Here and there in the monasteries intellectual life flickered, and some stray sparks would be brought by Jews coming from Mohammedan lands. The beginnings of a systematized intellectual effort is found in the schools of Salerno and Montpellier. In the 11th century Constantinus Africanus, a widely travelled man and at one time teacher in Salerno, translated ARabic writings into Latin, thus beginning a movement that gathered speed with the years. But ophthalmology in those days of twilight was nevertheless little more than a debased handicraft; couching for cataract, like cutting for stone, was an operation which everyone was allowed to perform, and was in fact left to itinerant practitioners. The regular practitioners of surgery advised against eye operations and paid but scanty attention to eye disease in general. The writings of Peter the Spaniard (later Pope John XXI) are a treatise on the hygiene of the eye and contain no reference to surgical treatment. The writings of Master Zacharias, a Salernitan of the 12th century, are of little significance but those of Benevenutus Grassus are of considerable importance in the history of ophthalmology. Little is known of the author, but the book had a great influence in spreading knowledge of eye disease. The original seems to have been written in Hebrew and there are translations in Latin, Provençal, Old French and Old English. There is little new in the book; it is essentially a good summary of Greek and Arabian teaching. The importance that medieval ophthalmology attached to it can be gathered from the fact that it is the only ophthalmic incunable. Guy de Chauliac and John Yperman were influenced by Benevenutus' book, Yperman himself contributing to ophthalmology the conception of contagiosity of ophthalmia. If the Western Middle Ages produced no memorable oculists, it produced geniuses who in their versatility contributed to ophthalmology. Roger Bacon's ophthalmic achievements include the rediscovery of the crossing of the optic nerves at the chiasma and the first mention of convex lenses for presbyopia., whilst Leonardo da Vinci either realized or came very near to realizing the principle of the camera obscura as applied to the eye. If the practice of ophthalmology had hardly advanced during the long centuries that followed Greek medicine at its height in the Rome of Galen, it had little to gain at the Renaissance by looking backward. Further advance in ophthalmology was made possible by the study of the anatomy of the eye, and by an understanding of the mechanism of vision. This was the wrok of the 16th and 17th centuries and paved the way for the great pathological and clinical progress of the 18th century, the century of cataract extraction and the artificial pupil. The first half of the 19th century was a remarkable period of consolidation, and the second half brought the operative treatment of glaucoma, whilst the ophthalmoscope opened a world undreamt of and raised ophthalmology to the most exact of clinical studies.